What Are the Benefits of Chickweed Tea? Lapacho, which is also referred to as pau d'arco, is an evergreen tree that is native to South America. 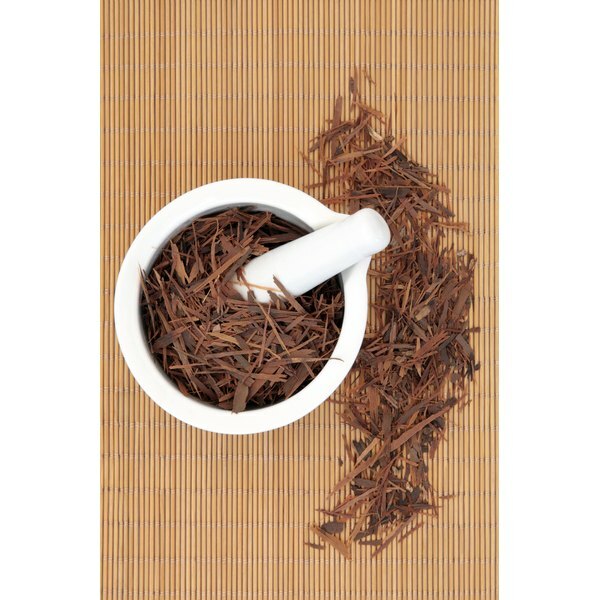 The inner bark and wood of the tree has been used medicinally for centuries and it is dried and sold as a tea today, for a variety of health purposes. As with any herbal product, consult your health-care practitioner before attempting to self-medicate with lapacho. The active constituents of lapacho are thought to be the two compounds lapachol and beta-lapachon, as well as their derivatives. Lapachol and beta-lapachon appear to demonstrate anti-inflammatory, antimalarial and immune-modulating activity. The University of Maryland Medical Center states that lab tests suggest that they also have antimicrobial properties and may therefore help to kill bacteria, fungi, viruses and parasites. Lapacho tea also demonstrates antioxidant activity and may help to prevent free radical-induced damage to your cells and DNA. According to “Natural Medicines Comprehensive Database,” alternative medicine uses lapacho tea as a general health “tonic and blood builder.” People also use the tea to help treat cancer, diabetes, allergies, gastritis, liver ailments, asthma, bronchitis, cystitis, hernias, chlorosis, fever, warts and smoker's cough. One peer-reviewed, study, from the December 2012 issue of "Phytotherapy Research," found that lapacho tea helped control blood triglyceride levels in rats. Lapacho is also used to help reduce pain and treat inflammatory disorders such as inflammatory bowel disease, arthritis, prostatitis and rheumatism. In addition, the tea is purported to promote the healing of boils, ulcers and other wounds. These uses are based largely on anecdotal reports and historical use however, and not on solid scientific evidence. Due to its antimicrobial properties, lapacho tea is used in alternative medicine to treat a variety of infectious disorders including Candida yeast infections, infectious diarrhea, bladder infections, herpes simplex virus, parasitic infections such as schistomiasis and ringworm; gonorrhea, syphilis and brucellosis. In addition, people drink lapacho tea to help treat viral respiratory infections including the common cold, flu and swine flu. More research needs to be done to confirm the efficacy of lapacho tea for these purposes, however. When consumed at recommended doses, lapacho tea is unlikely to cause side effects, but anemia, nausea, diarrhea and dizziness have been reported. Excessive amounts of lapacho tea, exceeding 1.5 g of bark and wood per day, may cause bleeding and vomiting. Lapacho may have anti-clotting properties, and it may therefore have an additive effect with anticoagulant drugs and increase the risk for bleeding. It may also increase the risk for hemorrhaging in post-surgery patients and “Natural Medicines Comprehensive Database” recommends stopping the use of lapacho two weeks before any surgical procedure. Finally there is currently insufficient reliable evidence regarding the safety of lapacho tea for pregnant women, and they should only drink it under the recommendation of a qualified health-care practitioner. Phytotherapy Research: Lapacho Tea (Tabebuia impetiginosa) Extract Inhibits Pancreatic Lipase and Delays Postprandial Triglyceride Increase in Rats. Megan Ashton began writing professionally in 2010. When she isn’t writing, she works with clients as the owner of Total Health & Hypnotherapy. She graduated from Western University with a Bachelor of Arts in communications then continued her education at the Canadian School of Natural Nutrition, where she became a Registered Holistic Nutritionist. Megan is also a Clinical Hypnotherapist. What Is Sassafras Tea Good For?